The UH holster can work for many guns and many people, but retention should be treated with caution. 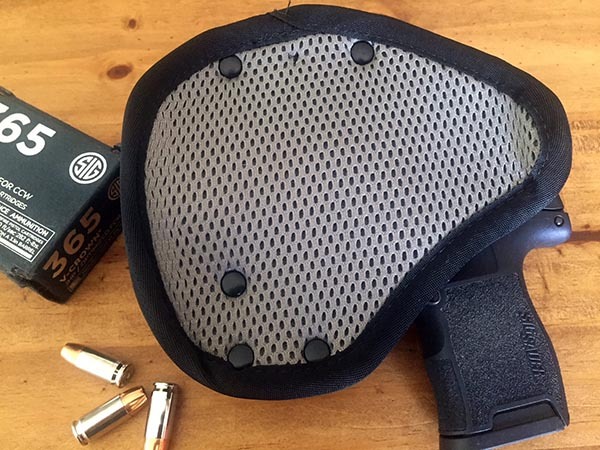 Probably just like you, I’m always on the lookout for a concealment holster that protects the trigger guard, has good retention, and is comfortable. I’m partial to appendix inside waistband (AIWB) carry too. So I was keenly interested when a holster named the Ultimate Universal Holster (UH) by Ultimate Hybrid Technologies of came across my radar. Would it really deliver safe comfort and concealment? I’m pretty much inflexible about the need for a holster to protect the trigger guard and have good retention. And I’ll admit, when I first dropped my Sig P365 into the UH, my initial reaction was oh hell no! But a moment of pondering led to the conclusion that I should study the product a bit more. The gun being so loose that it could rattle around in the holster seems like such an obvious flaw. There had to be more to the story. And there was. First, a little about the UH. The outer shell is Kydex, molded in the general shape of a modern semiauto. The company claims this design fits more than 100 handguns. There are two styles of clip available, and the holster name/model is reflective of whether it has the company’s trademarked Tacware belt clip or the Ulticlip3, for use without a belt. Attached to the shell is a soft, flexible, set of fabric layers, starting with a thin helping of memory foam. Next to the body is an anti-sweat mesh. These layers are bound by a thin strip of Cordura. The Kydex is secured to the backing with several rivets that are finished on the inside so there’s no direct metal-to-skin contact—an important and welcome point for this tester, one of the many people with nickel sensitivity. The Kydex sheath does indeed fit most handguns. I opened up the safe and tried dropping just about everything I own into it. Everything from a Glock 43 to a 17 fell easily into the holster. The only ones that didn’t were my a duty-size Springfield XD and Glock 42, both of which wear a light up front. Coverage of every trigger guard was excellent, but the channel above the slide seemed rather oversized, leaving lots of room for even the Glock 17 to rattle around and, if I turned the holster over, to fall right out. Having looked at an informational video sent with the holsters, I now understood that retention of the gun is accomplished by wearing the holster. In this way, the UH is truly unique. With the holster in place on my waistband, I can holster my EDC gun, a Sig P365, with ease and safety. 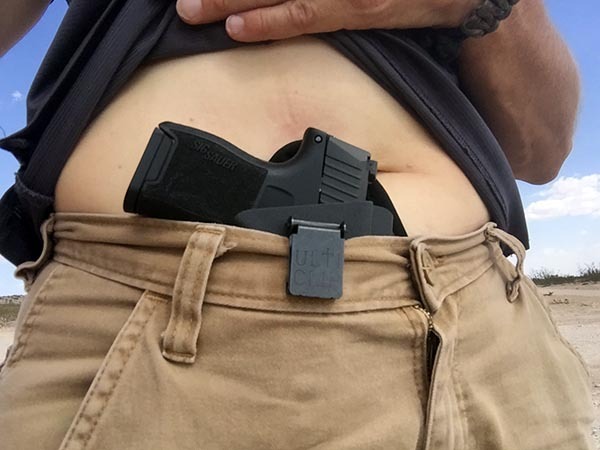 While it doesn’t have the same click-into-place feeling a custom holster does, with my belly pressing against the backing, retention is greatly improved. Greatly improved doesn’t mean perfect. It means I found myself able to do some range work including carrying targets and walking, mow grass on a tractor which can be bouncy at times, take a short hike, and, with the Ulticlip model, AKA MK1, go for a short jog. The latter activity is the first that challenged my faith in the retention. Though I never had any indication the gun would fall out, running over uneven terrain, yoga, and grooming my horse are things I avoided as the gun definitely can fall out if a person falls just so, or elevates the torso without also bending forward, i.e. the “bridge” position in calisthenics. The mesh lining on the back really helps breathability and comfort. Thumbs up in the sweat management department! As with a duty holster, it’s a necessity to remove the gun from the holster for using the bathroom when pants must be undone. This isn’t a big deal, but does require that the user be vigilant to not allow anything into the trigger guard, including fingers, while in the loo. For my use, and this may or may not apply to another wearer depending on their physical structure, I did find slight discomfort and a bit of redness anytime I sat for more than about 10 minutes, especially when indulging the urge to slouch even a little. A holster that rewards good posture can be a very good thing! It’s the edge of the holster under pressure from the muzzle, not the muzzle itself, making a hot spot. But with a longer-barreled gun, it’s possible the muzzle itself could jab a body in the thigh. There is a small height adjustment option on the MKII clip, and the leg-poking annoyance happens on the highest-riding setting. This may not be an issue at all for a taller wearer. I was pleasantly surprised that I can jog with the MK1 model, and there’s no way it’s coming loose. That clamp is tight! In fact, the MK1 comes with a warning not to use it on a belt, or it’ll get bent out of shape for wear with non-belted pants/skirts/shorts. The MKII clip is angled for good grip on a belt, and it works. It was a joy to wear the holster with jeans-type pants and no belt, especially as metal buckles have been my nemesis in combination with the aforementioned skin allergy this summer. The large sight channel adds some bulk and contributes to the retention issue, with the upside being that it accommodates a ton of firearm models. Nevertheless, printing is minimal. Printing is ever a concern with any waist-borne carry method. I struggled with this a tad more on the UH holsters than with my usual EDC rig. Blame that wide sight channel–it’s more Kydex than any of my handguns need. 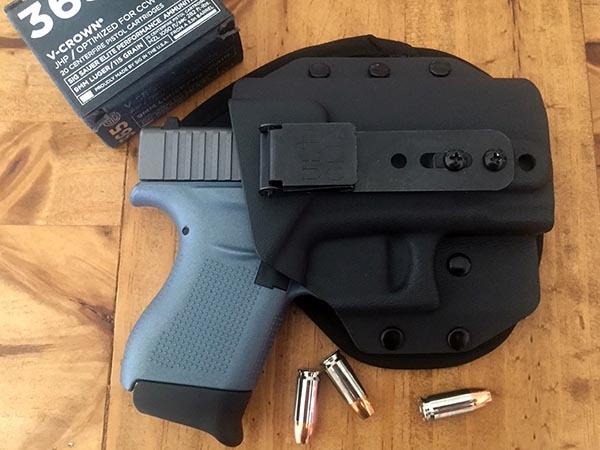 It’s this daily carrier’s opinion that the Ultimate Hybrid holster is safe and recommended for activities like walking or jogging on predictable surfaces, and other activities that don’t involve turning oneself at funny angles that could invite gravity to do its thing with the firearm. It’s going to be the ticket to freedom for some people who need a way to conceal inside athletic wear, assuming they understand there’ll always be a balance between gun weight and waistband tautness. With a drawstring on my shorts tied in a gentle hug, the holster fit fine for jogging and doing household chores. 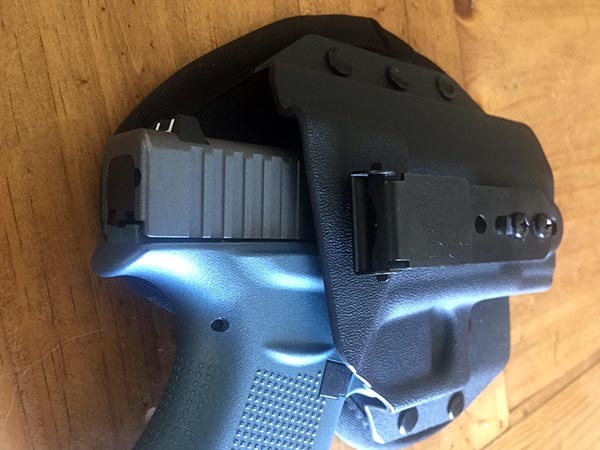 I’d love to see the Ultimate Hybrid Technologies company roll out a more customized Kydex shell on their outstanding, highly comfortable backing–perhaps even just one for the average subcompact, without so much wasted space above the slide. That would resolve most printing concerns. At $49.95 for the MK1 (Ulticlip3) and $39.95 for the MKII, the UH provides a good, US-made option for those who want a holster that will serve them comfortably, within the context of planned activities, without breaking the bank.